The Waterbase Ltd. is a leading manufacturer of high quality shrimp feed in India. The company also processes shrimp in IQF, Block Frozen and Cooked form from its own captive farms, and exports its produce to global markets, predominantly Japan, Europe and the United States. The company’s processing plant is FDA listed and EU approved, and processing is done as per HACCP guidelines. The company was founded in 1987 as Thapar Waterbase Limited and was promoted by Mr Vikram Thapar, Chairman of the KCT Group, a diversified Indian conglomerate with business interests in logistics, coal and commodity trading, capital goods, real estate and renewable energy. Waterbase is well known as pioneers in Indian Aquaculture Industry. Model ponds are developed in Nellore for all kinds of Shrimp Farming. The Company gives great emphasis to Research and Development to ensure that farmers are provided with tested quality of Inputs to obtain Optimum Food Conversion Ratio (FCR) and help in good farm management. Waterbase believes that Shrimps growth is directly related with quality Feed. ISO 9001 Certified Shrimp Feed Mill. 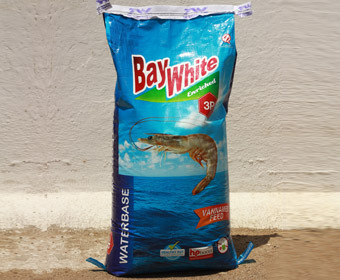 Bay White is the first successful Indian brand developed for "Vannamei" shrimp (Litopenaeus vannamei) farming. It is formulated as balanced feed with all essential nutrients required for producing healthy shrimps. A mixture of highly digestible marine and vegetable proteins from a perfect mixture to match the ideal protein specification for the Indian white shrimp. Bay White Enriched is a new generation shrimp feed that meets the requirements of vannamei farmers in India. Formulated using premium ingredients and up-to-date nutritional know how, it is enriched with unique functional additives. This increases the shrimp’s capability to cope with stress and disease. Thus efficiently converting nutrients in to good health for the shrimps and also better profits for the farmer. 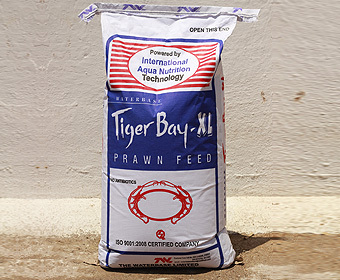 Tigerbay XL is a completely balanced and cost effective feed for modified extensive farming of Tiger shrimp. Tiger Bay XL is a performance proven feed in all regions of India, mainly in Andhra Pradesh, Orissa, West Bengal and West Coast. Tiger Bay XL also performs better in high density Vannamei farming and has shown excellent performance. Magnum is one of the better performing feed for Scampi (Macrobrachium Rosenbergii) in India. 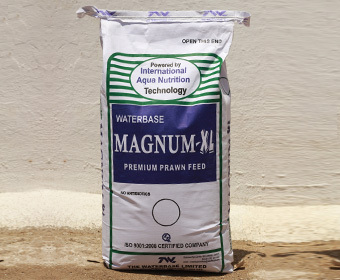 Designed to perform with low FCR and fast growth, Magnum is incorporated with high quality attractants, low phosphorous leaching plant protein sources. Magnum contains molting stimulators, which ensures better weekly growth and assures profits to farmers.